In what indicates an increase in investment by public sector enterprises, the growth in cash and bank balances of PSUs declined during 2010-11. 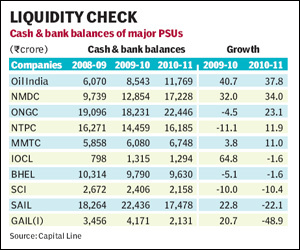 The growth in 43 PSUs cash and bank balances fell from 13.3% in 2009-10 to 7.1% in 2010-11. The cash ratio for these PSUswhich include central and state enterprisesdeclined to 55.24% during 10-11 from the level of 61.1% in the previous year, 09-10. The cash ratio (cash & bank balances divided by current liabilities and provisions) is an indicator of the extent to which a company can pay its current liabilities with cash in hand without relying on the sale of inventory and receivables. A comparative study has been made for 43 public sector undertakings, excluding banks and NBFCs, for 08-09 to 10-11. The combined cash & bank balances of these companies increased by 13.3% to R1.44 lakh crore during 09-10 from the level of R1.27 lakh crore during 08-09 and rose further by 7.1% to R1.54 lakh crore during 10-11. A steady increase in cash and bank balances was seen in the case of MMTC, NMDC, Oil India, Power Grid Corpn., Bharat Electron, Nalco, Container Corpn.,GSFC, Gujarat State Petronet, SJVN, KIOCL, MOIL and Coal India. The cash & bank balances of MMTC steadily increased from R5,858 crore during 08-09 to R6,748 crore during 10-11. The current liabilities and provisions of the 43 PSUs increased from R2.10 lakh crore during 08-09 to R2.78 lakh crore during 10-11. A steady increase in current liabilities and provisions was seen in the case of BPCL, SAIL, BHEL, HPCL , Oil India, IOCL, Nalco, NMDC, BEL, and Engineers India. The current liabilities and provisions of BHEL steadily increased from R28,384 crore during 08-09 to R39,011 crore during 10-11. The ratio of cash & bank balances to current liabilities and provisions, which is used to measure the liquidity, decreased during the study period. The top five PSUs according to cash ratio during 10-11 were NMDC, MOIL, Orissa Minerals, Container Corporation and KIOCL. The cash & bank balances of NMDC increased by 32% from R9,739 crore during 08-09 to R17,228 crore during 10-11, with a 34% increase in the last year alone. The current liabilities & provisions of the company also steadily increased from R1,165 crore to R1,781 crore during the study period. Accordingly, the cash ratio of the company increased from 836.20% during 08-09 to 967.48% during 10-11. A steady increase in the cash ratio was seen with 13 PSUs. Mention may be made of NMDC, MOIL, Orissa Minerals, Oil India, Container Corpn and SJVN. A steady downward trend in the cash ratio was also seen in the case of 13 PSUs. Mention may be made of Nalco, NTPC, Engineers India, NTPC, BHEL, GAIL(I), HOCL, Petronet LNG, Tide Water Oil, BPCL, HPCL and GMDC. In the sector-wise analysis, a significant decline in the cash ratio during last three years was seen in the case of aluminium, chemicals & others, diversified, electric equipment, engineering, gas distribution, lubricants, paper, power generation, refineries and steel. The cash ratio of gas distribution companies decreased from 46.30% during 08-09 to 22.38% during 10-11. An upward trend in the cash ratio was seen in the case of fertilisers, metal,mining & minerals, oil exploration, shipping, trading and transport. The highest and lowest cash ratio was witnessed in 10-11 in the case of transport and refineries, respectively.